During the Great War West Riding Police Force went along with their daily working lives – patrolling the streets on foot, being a presence on the streets and dealing with the unsavoury side of life that arose. During this time they had the added an extra burden of vast numbers of soldiers, either stationed in the West Riding, on leave in the area, passing through on their way to postings or returning to the war. One task that became an everyday occurrence was being on the look out for soldiers overstaying leave, absconding – being AOL (Absent without leave). The everyday lot of the local ‘Bobby’ was about to change for them and their families. The police were exempt from enlisting for the early part of the war. This all changed in December 1915, when all members of the police force under 41 years of age (including Walter Siddle) attested and were placed n the reserve list under Lord Darley’s Scheme (World War 1). By March 1917, the goal posts were moved and all under 41 years of age were to be examined by the Army Medical Board. 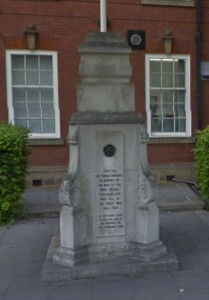 The memorial to the men of the West Riding Constabulary situated at Laburnum Road, Wakefield carries the names of over 60 men from WW1 and 26 names from WW2. 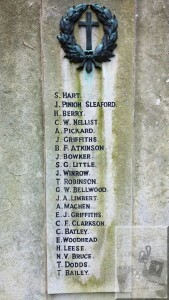 Of the 60+ names from the WW1 memorial one name stands out amongst the rest due to the unusual middle name – John Pinion Sleaford, now doesn’t that roll off the tongue? John’s early years were spent in Lincolnshire. He was born in or around Walcot, Lincolnshire on the 24th May 1890 and baptised on the 26th of February 1899. The entry for John in the registers of St Michael’s Billinghay and St Oswald, Walcot show that his parents, Charles and Hephzibah Sleaford had four of their other children baptised on the same day. The entry also shows where John, his sister Sarah and brother Arthur came by their unusual middle name ‘Pinion’, Hephzibah’s maiden name was Pinion. Charles on this day gave his occupation as a cottager. The 1901 census gives the details of Charles, his wife and nine children living at Fen Road, Walcot – Charles now classes himself as a farmer. Ten years later in 1911 census more information is given and it appears that John was one of 10 children, nine of which survived to be included in the census. Home for John, a 20 year old farm worker, and the rest of the family was Walcott Fen, Billinghay. Later working for James Franklin a local farmer. John aged 21 left his native Lincolnshire and signed, on the 5th of January 1912, the Declaration to become a constable in the West Riding Police. Aged 21 years and 7 months, John was 5′ 9 ¼” tall, with a fresh complexion. He had dark brown hair and grey eyes, having no particular marks and stating that he was a single man. John also had to give a specimen of his handwriting. 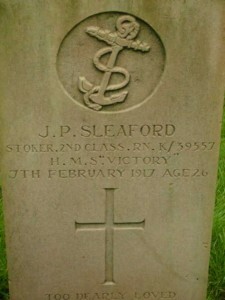 John Pinion Sleaford, warrant number 7785, was from November 1912 stationed in Staincross and by January of 1913 had advanced from third to a second-grade constable. In the early summer of 1915, John returned to Lincolnshire to marry Ellen Blundy. Using both John’s and Ellen’s surnames in a search it seems that there were two children born – Leonard in Grantham, 1915 and Edith in Penistone, 1916. John joined the Navy, becoming Stoker 2nd class, K 39557, serving on HMS Victory II from 10th January 1917 to February 7th of the same year (this could have been a shore base). 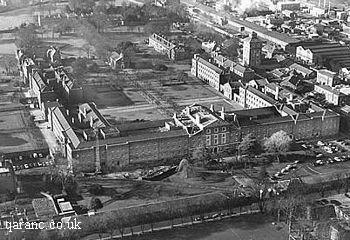 From 7th February John was in the Royal Naval Hospital Haslar, Gosport, Hampshire, which had been a naval hospital since the mid 1700’s and was the last to lose its military status in 2007. John died on the same day of his admittance to HMH Haslar, the 7th of February, from pneumonia and heart failure and rests in the churchyard of his native village of Walcott near Billinghay. By this time Ellen was living at Hill Top, Clayton West. can be found doing ‘unpaid domestic duties’, while Leonard works as a clayware labourer and Edith is a worsted spinner. Leonard married Madge B Carter in the Hendon area. Edith, however, there are a couple of entries for a marriage that could be her, one in Bradford and the other in Sleaford……….so I will leave that one for others to sort out. Ellen died in 1960 and it seems she did not tie the knot again. This entry was posted in General on December 4, 2016 by carol.